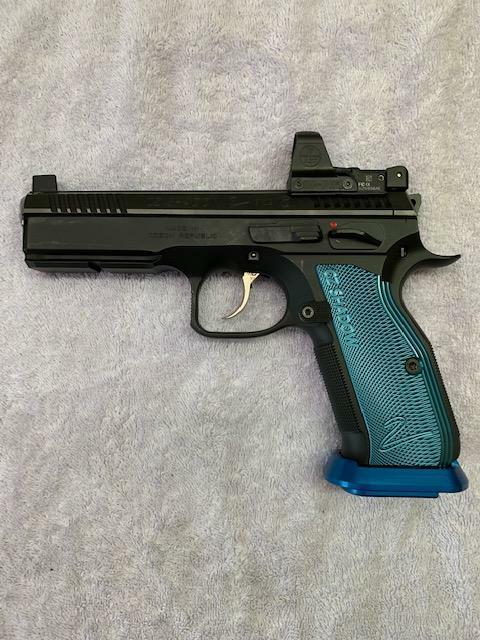 CGW modified my slide and added a Delta Point Pro and a taller front sight from Dawson Precision. Does it weigh 45 oz. or less? Hmm, what do you plan to use it for? Local steal shot competitions as they are very flexible. Yeah, I shoot steel myself. Great fun, and loose requirements. In fact, that is the only use I have for my S2 - I don't shoot USPSA, and my S2 is too heavy for IDPA. Does your steel matches allow CO in "stock" class, or does the optics bump you into "open"? That is a good question as this sat will be the first time that I shoot it for the comp. I will have to see, as Im unfamiliar with the categories they have.